In the Valentine's Day issue, Sniffapalooza Magazine features Roses et Chocolat - The Complete Collection. Roses et Chocolate, Tamya and Bon Zai are featured in Sprig.com top-10 list of organic and natural perfumes. Kimono Sachets, originally uploaded by Ayala Moriel. From a Western point of view, Japanese don’t seem to be taken with perfume. At least not the way we define it. I’ve heard too many stories about the Japanese market, for example – the many unopened perfume flacons displayed in Japanese home as evidence that clearly Japanese are uninterested in fragrance and perhaps even to the extent of criticism - i.e. : Don’t judge a book by it’s cover. However, preference for smaller objects (i.e. : 1/4oz flacon rather than a 5oz spray bottle) and appreciation for the flacon design should not be mistaken for dislike of aroma or inability to enjoy and appreciate scent. If anything, the Japanese have a history of designing unique containers for their scents – since Japanese traditional clothes had no pockets, they’ve designed inro for men - these were tiered boxes for storing small items such as incense and medicine; and silk sachets and kinchaku for the ladies, as well as beautiful lacquered boxes with intricate and stylized botanical designs for storing cosmetics and aromatics. Also, a special accessory was developed for the sole purpose of hanging the kimono in front of incense to scent it. Not to mention they have used scent to indicate the passing time with an incense clock! These all indicate that aromatics - and especially natural ones - play an important role in Japanese culture and are much esteemed – and this is true for both the past and the present. The reason for the Western misunderstanding of Japanese perfume-culture is two-fold: The physical form of perfumes enjoyed in Japan is different; and the scents themselves are far more subtle and gentle than Western perfumes – both commercial and historic. While Western perfumery has evolved from incense into liquid perfumes (mostly alcohol base and recently also with other liquid bases such as oil or silicone), Japanese perfumery has remained mostly focused in the mostly raw materials – dry aromatics that emit their fragrance as they are (i.e. : sachets and powders) or when burnt (incense). This stands in line with the Japanese love for purity and perfection. As with any cultural differences – this can either be perceived as a technological disadvantage that limits the scent palette; or a point of difference that makes scent cultures across the world more interesting and makes traveling just a little more meaningful in this time of globalization where you can pretty much find anything anywhere. Japanese seem to dislike the scent of alcohol (which could also explain the preference for parfum extrait - these formulations have less alcohol and more essence, thus reducing the impact of alcohol in the opening phase of the perfume). In addition, they are fortunate to have very little body odour and therefore don't feel the need to mask it as much as us Westerners are inclined to do. As for the aromas themselves – similarly to the cuisine in Japan, Japanese perfumes (i.e. : incense, sachets and body incense powder) are subtle and use a more limited palette of aromatics. The most dominant component is woods: local woods such as cedar (Hiba) and pine (Hinoki) and the more exotic ones imported from the south – agarwood (Jin-koh) and sandalwood (Byaku-dan). Especially with the sandalwood and agarwood, there is much attention to grades – affected by how and where the trees were grown – so much that they have many different names (i.e. : Kyara is the name for the most prized grade of agarwood, which is the most rich and dark in aroma). Other significant aromatics in traditional Japanese perfumery are gum-resins such as borneol and camphor, myrrh, frankincense and benzoin; roots such as galangal (alpinia) and spikenard; patchouli leaves; and spices – cloves, cassia, cinnamon and star anise. To truly appreciate the subtleties and slight difference between one incense or another, one must develop a sensitive nose; just like one’s palette has to be trained to truly understand and appreciate the art of tea and the subtle differences between one kind to another – after all, teas are all made from the exact same species! The picture above is of sachets by Shoyeido incense company, sent to me by Yoko (she has been extremely generous and helpful in satisfying my Japanese olfactory culture curiosity!). They are for scenting Kimonos, and are usually tucked into the sleeves. This not only helps to make your kimono smell wonderful, but also helps keep away the silk-hungry moths. It smells spicy and camphoreous – but in a rich, luxurious way. In fact, it smells very much like a high quality carnation soap (which is one of my favourite things to tuck among my clothes); and smells nothing like moth-balls. There is an air of tranquility to all of the scents I’ve experienced from Japan. They smell like a dark room in an antique wooden house, and that’s how I imagine houses in Japan to smell like. There will be only one way to find out! Japanese Stationary Sachet, originally uploaded by Ayala Moriel. My friend Yoko has surprised me yet again with a collection of Japanese olfactory items. 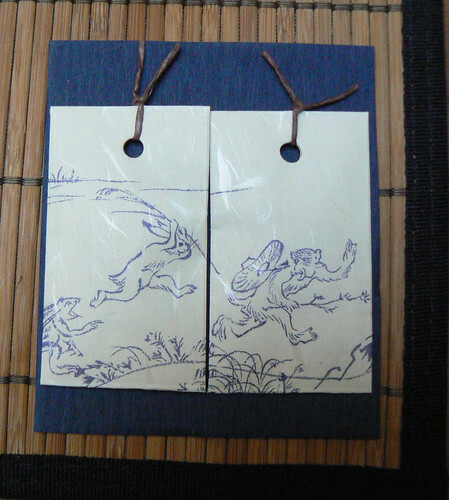 In the one pictured above are sachets by Kousaido decorated with children-story illustrations that are especially made for scenting stationary. 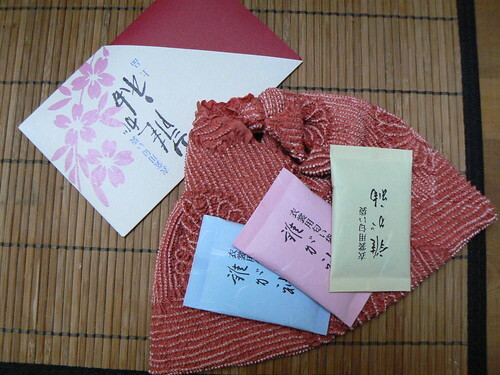 In the past, scent played in important role in match-making in Japan. A woman would pick her mate judging her suitor’s personality by his words and the scent of the letter that carried them. This is before cameras, not to mention internet - and these two factors alone could either mean marriage or - never meeting the man at all. Letters would be scented either with sachets, or more commonly - by waving the letter in front of the burning incense before sending it off. These particular sachets that Yoko sent me are not only pretty but also smell lovely. In an attempt to describe them I’ll say the smell like KenzoAmour Le Parfum but without the synthetic overpowering presence. If it was a perfume I would wear it now. The notion of this romantic correspondence surely makes me want to go back to sending letters again - real ones with ink on paper. But I must admit: these beautiful stationary sachets are too pretty for my stationary (I have a strange interest in Asian stationary - from both Korea and Japan - but they are all way too juvenile for this scent). Tune in tomorrow for more about the content of the package and other Japanese olfactory traditions. The beauty section of Sprig.com features Ayala Moriel Parfums. Sprig.com is a daily green style guide, and is divided into green fashion, green home, green beauty and green celebrity. Click here to listen to a radio spot about the re-opening of Grasse museum of perfume history, featuring a short interview with Jean-Claude Elena. 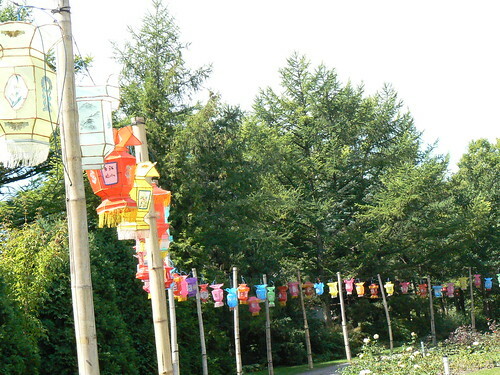 Chinese Lanterns, originally uploaded by Ayala Moriel. Gung hey fat choy to those celebrating Lunar New Year today! May the year of the Ox be a year of peace, prosperity and luck. Purple rose of Cairo, originally uploaded by ay_caramba_nz. This perfume was created after exploring Indian roses and exotic attars while watching The Purple Rose of Cairo. The name was selected as a tongue-in-your cheek gesture to fluffy perfume ad-copies and fragrance literature laden with purple patches. Consider this to be the part of the film where the screenwriter converses with its characters while they step out of the silver screen attempting to get a life. Purple (p)Rose is rosy and exotic. Many essences extracted from plants grown on Indian soil seem to have a certain sweetness, depth and spicy richness. I sometimes wonder if there is curry in the Indian soil that affects the aroma of these plants and make them stand apart from those grown in other countries. The essences I chose are mostly ones that I associate with the colours purple and blue. There is no particular logic behind that notion, it's completely intuitive. There is no way for me to explain why I think champaca smells purple or Buddha wood smells blue. I can only hope you will understand me if you smell them. The opening notes are rosy with hints of spice and fruit, evolving into a plush floral heart with traditional Indian rose attars of rose and oud, ruh gulab (a traditional Indian distillation of rose), red champaca, blue lotus and blue waterlily to compliment the purple theme. And finally, deep woody notes of sandal, oud and Buddha wood, precious and sublime encompass all and invite meditation. Now available via Etsy under the One-of-a-Kind Perfumes section. 47-Purple Rose Of Cairo.JPG, originally uploaded by Tania Conrad. London Fog, originally uploaded by Ayala Moriel. Maybe it's the fog that's been possessing the city for the past week or maybe it's something else - but I've been obsessed with London Fog tea and Earl Gray in general. London Fog is Earl Gray steeped in steam milk with a touch of vanilla extract - or more likely you will get the vanilla syrup in most coffee/tea shops. 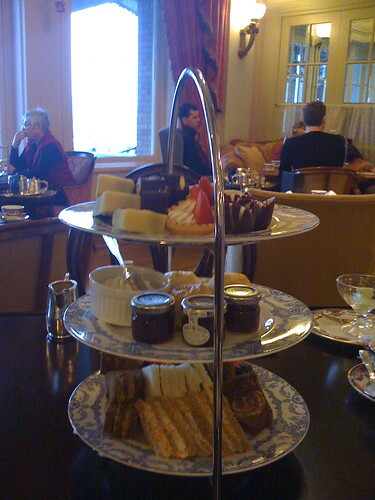 High Tea @ The Empress Hotel (Victoria), originally uploaded by Ayala Moriel. On the way home the next night, we stepped to the deck to try a vanilla flavoured cigar. It's not as burning as other tobaccos but I still think that it's better to passively smoke pipe tobacco than actually have the smoke linger in your mouth. It was very much like drinking a cup of tea that was steeped too long - acrid and burning but a little sweet too. The fog hugged the boat so tightly and was so thick it looked like a screen was hang in front of the deck. It was chilly. Vancouver Fog, originally uploaded by Ayala Moriel. I came back to Vancouver only to find that the whole city is fog-bound. We're practically living in a cloud for a week now with only glimpses of sun yesterday and today. 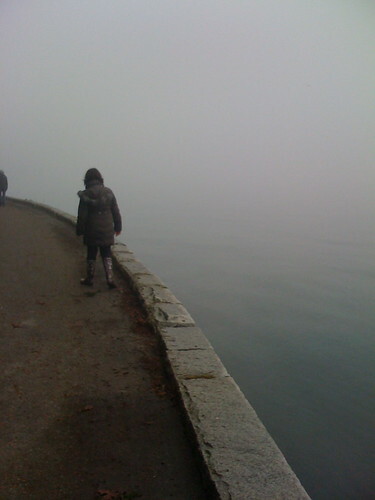 Going for a walk on the Seawall on Saturday one could not see where the ocean ends and the sky begins. There was no horizon whatsoever. 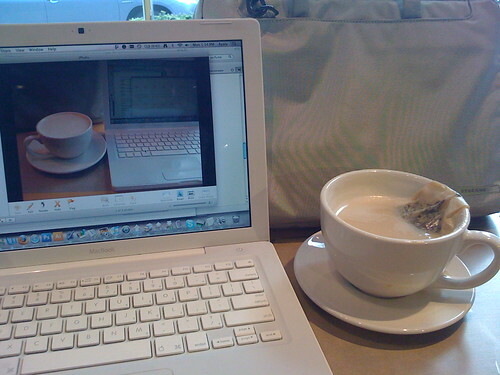 And so I've been indulging on London Fog teas as you can see (the on the laptop screen is from January 15th, and the “real” one is from today). Yesterday I found a particularly exciting chocolate at the new Urban Fair the just opened a block away from my place (phew, finally a grocery store that I can rely on - it opens daily at 6am! ): Earl Gray flavoured dark chocolate by Dolfin from France. The surprise thing about it is not just the intensely Earl Gray flavour, but also the crunchy tea leaves inside. It’s a new favourite. 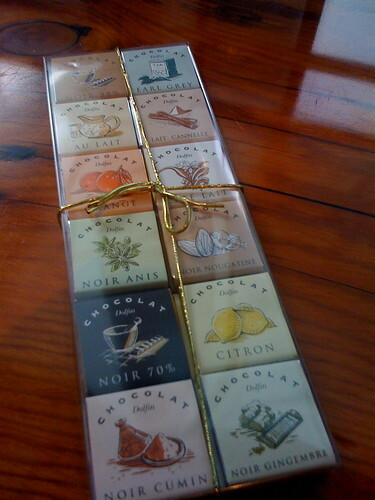 Dolfin Chocolates (featuring Earl Gray), originally uploaded by Ayala Moriel. So how’s that all connected to perfume? I’m not sure yet. Should I try to make a Londong Fog perfume? Perhaps not. Perhaps I should keep sipping the tea and indulging since Gaucho has such a significant amounts of both bergamot and tea (not black but mate has the same acrid note in that context) I really shouldn't. But if I know myself at least a little, I probably won't be able to help myself. 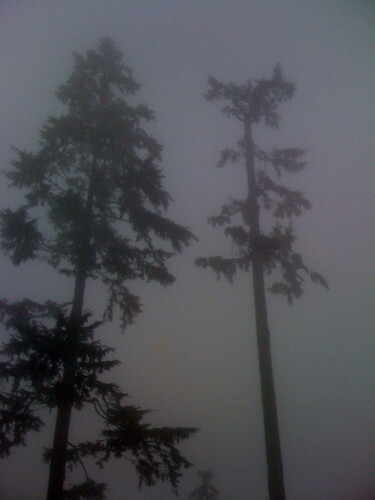 Cedars & Fog, originally uploaded by Ayala Moriel. The last-minute (good) surprise of 2008 was a new perfume from LesNez titled Manoumalia. I didn’t get to try it till 2009, and so I will probably forever remember it as the first new perfume I tried this year. As it turns out, it is not going to be available for ordering on the LesNez website till later in 2009 so watch out for it. Manoumalia is every bit a steamy, humid floral that intoxicates the senses and evokes faraway locals in a most vivid and genuine manner. It opens with what smells exactly like the houseplant in my lobby that was haunting me last August. It has the same kewda-like sharpness and headiness to it, initially also underlined with some juicy orange blossom and and humid tuberose notes. For some 30 minutes or so, it feels as if tropical flowers' nectar and jungle-leaf sap is mingled with salty sweat; the kind of feeling you get when you work in a hothouse. The initial Dracena fragrans note fades out after the initial blast of tropical steam and turns into a soft, creamy tuberose and ylag ylang that remains subtle and subdued for the remaining of its life on my skin - with soft woody murmurs like the hushing leaves in the jungle at night. The author this time is Sandrine Videault, Roudnitska's last student, who was inspired by the rich botanical heritage of the island of Wallis (a French island in the South Pacific). In the island of Wallis, Fragrant flowers are used in rituals and ceremonies and are tied into leis and garlands that are equally colourful as they are fragrant, and sandalwood powder is used to perfume the hair. The fact that she herself was born in that area adds to the authenticity of the scent, something that comes across in the photographs that accompany the press release from LesNez. It looks as if she took the role of an anthropologist to study the perfumes of the island. There is more about this in the press release (unfortunately completely in French so I am unable to deliver any additional information).In the above photo you can see her smelling Fragraea (Fragraea berteriana), a highly perfumed flower from a tree native to the island. I have never smelled fragraea but sure hope I will one day. Ayala Moriel is proud to introduce the 4th offering in our scented candle collection: Roses et Chocolat. Like all of our candles, Roses et Chocolat candle was created in joint collaboration with Nikki Sherritt of Garbriel’s Aunt, who lovingly hand-pours each candle to perfection. And of course it was her idea to add cocoa butter to the wax to create that creamy, melt-in-your-mouth chocolate texture to the candle’s overall fragrance. The Complete Experience Gift Package of Roses et Chocolat includes all the good things: perfume, chocolate, tea and the new Roses et Chocolat scented candle, of course! Experience perfume to the fullest with taste, touch and fragrance. The Complete Experience Gift Package includes our Roses et Chocolat perfume, scented candle, perfumed tea and our to-die-for Blood Truffles - our seductive 70% cocoa hand-rolled truffles flavoured with Turkish rose otto, saffron absolute and hot chili pepper to add some pizzazz! All packaged in a beautiful, re-usable gift box with a hot-pink satin ribbon as the final touch. Turtles Hatching Sand Sculpture, Keauakapu Beach, originally uploaded by Don Briggs. Turtle Vetiver started crawling my way in 2008 and didn't make it here via snailmail in 2009. It was a surprise addition to the samples of Manoumalia that I was really hoping to try before the end of the year (it would have made it to my best-of-2008 list but I guess that will need to wait to the next roundup. The sample vial was labeled "Exercise 1", so at first I thought that this is not the finished perfume but a first mod in a perfume in progress (it is described on LesNez as "Outlaw Perfume in Progress"). However, as it turns out - Turtle Vetiver is an ever changing Eau de Toilette that Isabelle makes in small batches as contribution to the creative network titled Turtle (I'm still trying to figure out the actual connection to turtles). Turtle Vetiver it is an interestingly bold vetiver and already got my attention not just because of the quirky name, but also because it is just in-your-face dirty and gritty vetiver roots before the soiland sand grains have been rinsed off. It opens very shapr and bold, with a certain peppery darkness to it and a coolness that can only be likened to heavy wet sand that is slightly bound by flossy rootlets of seashore plants. Once it settles on the skin it reveals the cool, clean, fresh and soft Haitian vetiver which I can only guess is the main ingredient. I'm curious where else will Isabelle Doyen take this vetiver interpretation. There is hardly a lack of vetiver scents on the shelves and I'm always surprised at how original vetiver fragrances can still remain even though there are already so many. I am starting to think that vetiver is like tea... The differences are subtle, but make the world to those who can notice and appreciate them. Samples can be ordered from LesNez website. dreaming of you, originally uploaded by Amsterdamned!. In Dans tes Bras, Maurice Roucel brings up the unspeakable topic of intimacy. Intimacy is something that is difficult to describe, but easily felt. It's a subtle emotion and a state of mind that occurs when we somehow connect to another person on the deepest level through closeness or proximity. It's one of those strange connections between spirit and matter: looking into someone's eyes and having a glimpse into their soul; being so close you can hear their heartbeat and sense their breath on your skin and breathing in the invisible scent of their skin. Seemingly, there is nothing unusual about Dans tes Bras. It is very perfumey at first: violet accord that is both powdery like orris and wet and woody like cassie underlined by noticeable dosage of heliotropin - that vanillic molecule that makes heliotrope smells so sweet, almondy and plasticky all at once. It is not until a few hours in that the intimate aspects of Dans tes Bras reveal themselves. At which point, technically speaking the woody base notes (most notably patchouli) are exposed, along with foreign molecules which I’ve never smelled separately and which create the sensation of minerals and salt on hot skin. From a more sentimental point of view, this is the point where Dans tes Bras begins to smell like perfumed skin that has been immaturely washed away in a warm salty ocean, but not completely. Whatever is left on the skin is going to dry out in the hot sand and sun and become only a vague memory of that violet perfume but an even stronger memory of that sunny afternoon on the beach. But if you wait till the morning, you will wake up to remnants of Nag Champa incense smoke that has stuck to your clothes, sheets and everything you've ever possessed. U p s e t, originally uploaded by cool_A. 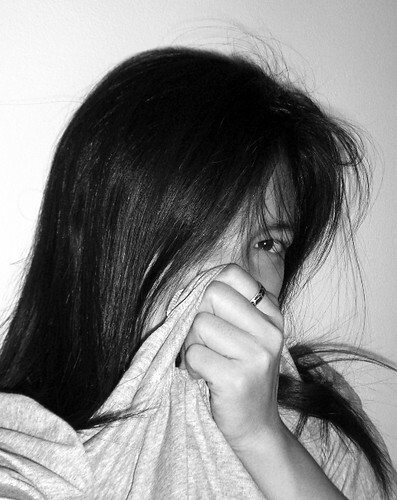 Have you ever found yourself smelling someone's clothes when they're not around? Apparently, you are not alone. “It was almost like a presence” said Melanie Shoup, the lead of a study about people smelling clothing articles of loved ones to feel closer to them, even after they've died; which makes the notion of the scent of things as their ether, essence or spirit almost literal. This is not a typical topic of conversation, but I will admit I've done it on more than one occasion. The scent of loved ones - and not necessarily romantic partners - is part of how we experience them in our life. It is an invisible presence that seem to take on its own existence and in a way, we have a relationship with it, not just with the person who exudes it. The Citron and the pretzels, originally uploaded by zuf1. 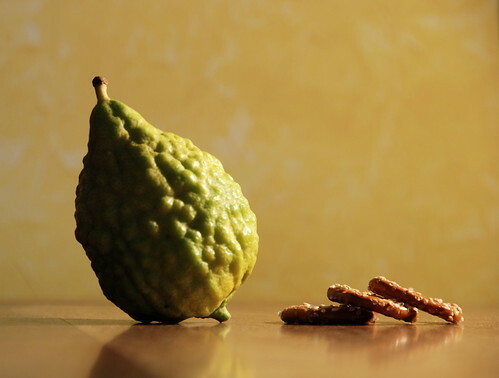 After Sukkot was over, I begged my mom to find some citron fruit in the village and make me some citron tincture following my explicit instruction. After a long search (there are only 2 families that grow these special trees in the village), she found one fruit and prepared the tincture. A week or so later, a basket with 10 more citrons awaited at her front porch. Some of which were used for candied citron peels. The goods arrived here safely, and now the challenge is to figure out what to use it for. Originally, I wanted to create a Sukkot perfume. Without any clear idea of what that might be. For now, I've used it in my first mod of the mandarin-sandalwood perfume. In the meantime, I also added some pomelo tincture I've made myself (this deserves an entry of its own). My only problem really is that sandalwood smells terrible on me in almost all forms so I'm going to recruit some volunteers for skin tests to see how it smells on more sandalwood-friendly skins. But these two sure give it a lift and make it more interesting than just tangerines and mandarins. As far as the citron odyssey is progressing though - at least I've finally got closer to some. It is such a strange, intangible citrus though. So much more subtle than anything else. It's more similar to pomelo than anything else, almost velvety; and from all the citrus fruit, citron reminds me of quince more than anything else. It is not exactly sweet, nor sour. Perhaps salty is the closest flavour? Just like the one in the above photo and its preztel-y company. "Inspiration is not something that comes in a flash. It is there within us and belongs to all. Nothing is less inspired than a suddenly inspired person! The components are already there inside you: elements, scents, colors, shapes… and when they express themselves you realize they have always been present. In fact, all my perfumes are sixty six years old!" - From Serge Lutens' interview for Victoria Forlova of Bois de Jasmin. Another interesting quote from the interview: "The great problem of commercial perfumery is that people keep buying it!" 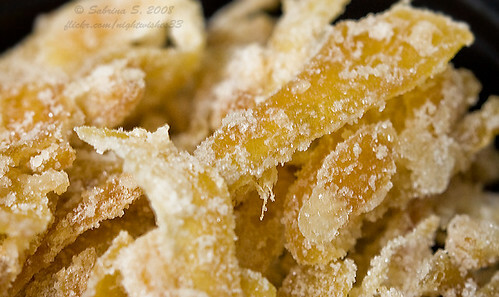 Candied Ginger, originally uploaded by Live♥Laugh♥Love. As promised - finally, my candied ginger cookie recipe, which I've invented this holiday season (blame it on the 2 weeks of snow and very low temperatures - the perfect time to perfect one's skills in the kitchen). These turned out so well that I didn’t have a chance to photograph them before they were gone! I will do my best to take a picture next time I bake them before my in-house cookie monster claims them. In this recipe, I tried to recreate the pleasure I've encountered in Squamish last spring with this decadent take on ginger that almost tasted like mastic and ginger. Of course, a cookie cannot taste like an ice cream but I wanted it to be special and very not gingerbread-like. Something more light and bright. 3. Add the candied ginger and stir well. 4. Add the flour gradually until fully blended and start kneading the dough with your hands. Add more flour if required. Dough should be soft but not too sticky. 5. Split the dough into two portions and roll them into two logs. Cover with a plastic wrap and refrigerate or freeze for at least 2 hours. 6. Preheat the oven to 350 F.
7. Remove from freezer, and slice the logs into 1/4" thick cookies. Place on a baking sheet and bake for 12-15 minutes. 8. While the cookies are baking, prepare the glazing (if desired) by mixing all the ingredients together with a small whisk or a fork. 9. Cool on the cooling rack for 2 minutes. 10. Using a pastry brush, apply the glazing to the cookies (optional). 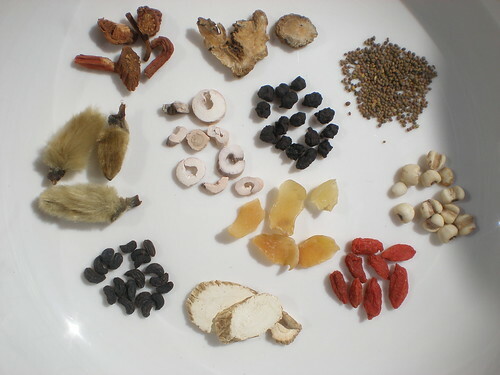 Some Chinese herbs, originally uploaded by egle_k..
Just before the year ended, some packages with supplies that got stuck in the holiday mail arrived. One of them had a sample of CO2 extraction of Magnolia Lily (Magnolia fargesii) - a type of magnolia that smells nothing like white magnolia or champaca. It has none of the fruitiness or sweetn floralcy of either. Rather, it is camphoreous and medicinal and leaves the palette bewildered as for whether it is hot or cold. It reminds me a bit of ginger lily (only woodier and less reminiscent of ginger and roots) and I immediately knew I would have to try it out in my 5th mod of the Amber & Ginger perfume (by the way, this is only the working name for this perfume) - a perfume I started working on last winter when I caught a bad flu and needed something to warm me up. All the more appropriate to add to it an essence that smells like a Chinese Apothecary! Incidentally, my spring cleaning also revealed some treasures. Literally. I found my lost formula for the 5-spice accord I was hoping to use in some upcoming revolutionary floral (I don't know what would be revolutionary about it but I can feel it). I also found 7 pendants, probably in the same drawer. Which a good thing because otherwise I would have needed to order more! So, the 5th mod of Ginger & Amber features the abovementioned Magnolia Lily, as well as a hint of Egyptian jasmine grandiflorum absolute (a stellar jasmine if you ask me). I also created a 6th mod, in which there is even more magnolia lily and jasmine, as well as some ginger lily (the root, not the flower). It is still just as juicy and cozy as the 4th mod that I loved, but thanks to the floral heart notes it has less of the hollowness that typifies perfumes based on a top-note & base-note marriage. Un anno fa, originally uploaded by fotomassimo. "my first New Years Evolution is to stop feeling bad about myself for any of my shortcomings - just let that go. But first I have to do a very un-male thing and accept that I actually have a shortcoming or two. Let me have a peek….yikes! I do. I gots some. Damn. So much for that mask of rigid perfection I thought I had to wear". Indeed, the term "resolution" implies that we are at some kind of discord or dissonance with ourselves that requires being resolved. Instead, why not look at who we are and where we are at, and accept it for once! Acceptance is the only way to true happiness. In my not so long life I've had enough ups and downs, turmoils and moments of bliss to understand that having this or that is not what will make me happy. Being happy with what I have is the single most challenging thing really. I'm not saying my life is perfect or that what I create is perfect. But I feel I am now at the point where I always dreamed of being: I can support my family doing what I love with passion and integrity; and both me and my family are healthy and have all that we need to live. What more is there to ask for? World peace of course! And now to more perfumey issues: this year holds many new adventures for me - including traveling and teaching more than I've ever done before. And while I am happy with where I'm at in both my personal and professional life, this does not mean it's time to rest on the laurels so to speak. I still have many dreams and goals and plans for the new year, which I hope will make a positive difference in the olfactory universe - even if very small. Always a work in progress and one that requires patience and perseverance as well as organization. There are alwasy new materials to explore and observing their behaviour on their own as well as with other notes is the only way to get "intimate" with them so to speak - to the point of being able to predict their behaviour almost scientifically and be able to use them creatively. These are not easy to find, and hardly ever a bargain. Something that can always be worked on. I didn't blog nearly as much as I would have liked to this year. I'm glad I managed to keep the blog alive, but I really would like to spend more time researching and writing for the blog. This commitment and virtual dialogue between myself and my readers has always been a source of inspiration and intellectual challenge. I especially enjoy the occasional common-theme blogging done alongside other bloggers (such as the 2008 in Retrospective that Perfume Shrine has initiated). While I was able to restore all of my lost data after my computer crashed, I was not able to restore my photographs. These digital images are lost forever - except for the ones that I have posted online (i.e. : on my blog or on Flickr). This was a huge let down for me and I nearly stopped taking pictures as a result. I want to change that and also come up with a better system for sorting out and storing my photos, as well as bring some to print. 7) Learn more about the science of baking. It's not exactly perfume related, but certainly one of my favourite past times and something I always enjoy writing about on SmellyBlog is aromatic cooking and baking. Aside from all of that, I wish for myself to be able to continue making perfumes for a living and that I will still be able to spend time with my family far away and keep getting better all the time. What are your wishes for the new year? And what are your hopes or expectations from SmellyBlog? I'm curious and interested to hear your views. [ Happy New Year ], originally uploaded by Đя εℓ7σв ♥ ~. Instead of the usual “best of the year” lists that are the customary thing to do, I like to also have a little bit of retrospective about the past year. Besides, who am I to judge what was best or worst, especially not having the capacity (or even the interest) in covering every possible scent launched this year (click here if you really want to know) ? And so Helg’s invitation from Perfume Shrine to participate in a pan-blog theme of 2008 in retrospective was most welcome. For me personally, this year was a bit different in terms of blogging. My life out of SmellyBlog has been so drastically busier than ever that I simply wasn’t able to dedicate enough time to blogging as I would have liked to. The result was, quite clearly, less blogging about perfumes (aka “perfume reviews”) and more blogging about my own work, which has consumed my time this year beyond belief. While I intend to do more blogging this year and study more of the many wonderful perfumes that I haven’t tried yet, I think it’s only fair to share with you here what was it that kept me so busy. In spring 2008 I have begun a whole new journey when I opened my doors to students eager to learn the art of natural perfumery. Leading to that, I spent the best part of the first quarter of the year writing the course’s handbook - what I thought at the time to be summarizing and condensing all of my knowledge in a simple and comprehensive 88 pages of words. I now realize that there was much more in my head that didn’t make it to this first edition, so a second edition is in the making and will hopefully see the light of day in 2009. Another equally interesting project has been writing the ad copy for the pure natural essences offered by Eden Botanicals. This is a work in progress and I am yet to complete the task. This has been a very interesting learning experience for me nevertheless, and often times required comparison between very similar essences (i.e. : oils of the same kind of plant generally speaking - just from slightly different species or that were grown in different parts of the world, or were extracted in a different method. This requires very fine observation skills and has been a fascinating source of learning for me. The fruit of my labour is yet to be posted on their website, but I will be sure to notify you when that happens. My students are few but a very inspiring bunch of passionate learners and each is posing me with a challenge of leading them to the way of finding new knowledge and unveiling their hidden abilities in the olfactory art. Teaching them makes me grow and become a better person, a better teacher and a better perfumer too. I have been working on plenty of accords this year. Accords are either complex or simple combinations of notes (usually at least 3-5) that can be used as a note within a more complex perfume. I’m particularly proud of my frangipanni accord, which is in my opinion far more true to the real living flower than frangipanni absolute; and than there are the more playful Thai curry accords, pumpkin pie and five spice, among others. It all begun pretty much with the Perfume Inside a Poem project, where I created a cherry blossom accord for my contributed perfume “Petals on Wet, Black Bough”. Since than I’ve been on a roll and creating new floral accords for future perfumes. I’ve just mentioned the Perfume Inside a Poem project, which was an incredible initiative of blogger Heather Ettlinger, and turned out to be an awesome experience. This was an interesting opportunity for connecting with the work of other perfumers, even if just virtually, and find inspiration in a poem. The other more tangible collaborations have been working with local businesses (Belmondo and Beyond Pilates), and last but not least - the new line of scented candles that I’ve worked on with Nikki Sherritt of Gabriel’s Aunt. Fine-tuning the formulas when “translating” them into the candle version has been a fascinating learning experience for both of us (albeit frustrating at times!). The result is 3 beautiful candles, and one more on the way for 2009. Lastly, I want to thank you all for reading my blog all these years and especially in the past year. I wish you all a very happy new year to come, and may it bring exciting fragrances. 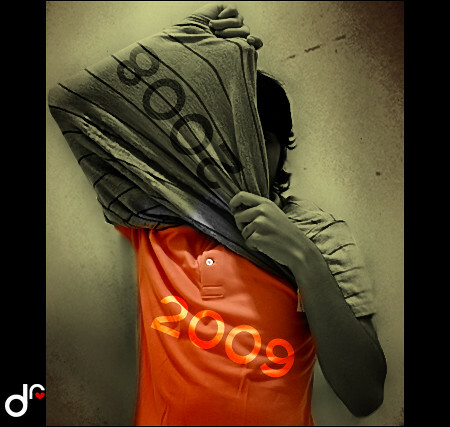 What else is there to say about 2008? For me, this was a year spent in a cocoon in comparison to previous years in the sense that I didn’t try much to get a hold of new fragrances. I’ve been carrying on the fatigue from the oversaturated market from 2007 to an even greater extent, as it only got worse this year. I didn’t even bother looking for newly launched perfumes, unless they’ve practically landed on my lap. However, some of the newly launched perfumes that I have tried were refreshing, interesting, even fascinating. There sure is hope for a positive change in the world of perfumery. At least we seemed to have gotten out of the sticky goo of pink bubblegum fragrances and celebrity copies of each other’s perfumes that marked the majority of the beginning of the millenia. We are definitely seeing more woody (vetiver, anyone?) scents, more green and refreshing ones that are not exactly aquatic in the 90’s-rave-sense, and overall, there are interesnting ideas floating in the air. Unfortunately, I have just been too busy to notice them or give them enough time beyond a scent strip. And to summarize, here is a very sweet and short (perhaps my shortest ever?) list of lists, including favourite perfumes that came out in 2008. As I feared, this is beautiful. Ever since I smelled it at the Guerlain boutique in Montreal I'm haunted. Considering that Les Exclusifs were my disappointment of 2007, this was a beautiful surprise! Not only because of the many fragrances based on it this year, but also because of my personal interest. Followed closely by ginger, which was a new interest of mine. I really did not expect to meet Tom Ford at Holt Renrew. Nor did I expect to fall for the mysterious charms of this dusky beauty. But I did. Now this is the kind of surprise that makes me look forward to 2009. Best worn when it’s unusually cold in Vancouver, preferably in addition and not as a substitue to your vintage Canadian beaver fur coat, as the perfume cannot keep you warm enough when it hits (-)30 degrees celsius. Davidoff Cool Water for men. Used to hate that stuff until I met a man who smells wonderful in it. It's smells awful and wonderful all at once, and certainly once you get your head wrapped around it its beauty is striking, even if distrubing. Unfortunately, both come from my all-time favourite perfume house. Cruel Gardenia, which to me was neither cruel nor gardenia; and Iris Ganache, which was overly sweet and plasticy smelling, where I was expecting white chocolate or cocoa butter. Un Jardin Apres la Mousson body lotion and dry oil, or anything really. In the absence of the Noel candles, and with all my new line coming in I'm proud to admit that my own Bois d'Hiver is my favourite scented candle, ever. I've been spoiled and can hardly look back to using anything that has synthetics as candles now. They now smell too strong for me, even the more delicate ones. Would love to hear what scents made this year for you - and wishing you all a Happy New Year!